100% nylon FD Powder Tech AP hard shell with 100% polyester Backtrax MTR Fleece lining and 100% nylon Graphic Wedge embossed 210 T taffeta. 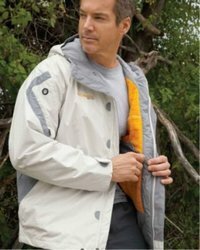 Waterproof and breathable outer shell lightly insulated with 60g MicroTemp. Attached hood with drawcord. Embroidered Columbia logo on right chest. Zippered pocket on left sleeve with headset wire port. Inside security pocket. Adjustable cuffs. Zippered hand-warmer pockets with fleece lining. Drawcord adjustable bottom hem.